Sewing Projects - Free Spirit & Mind! On this page I will be showing you different sewing projects you can do all on your own! Anything from making your own skirts, tunics, blankets etc… Not to mention we will be using recycled materials either from my own home, acquired free from craigslist or donations from friends & family. 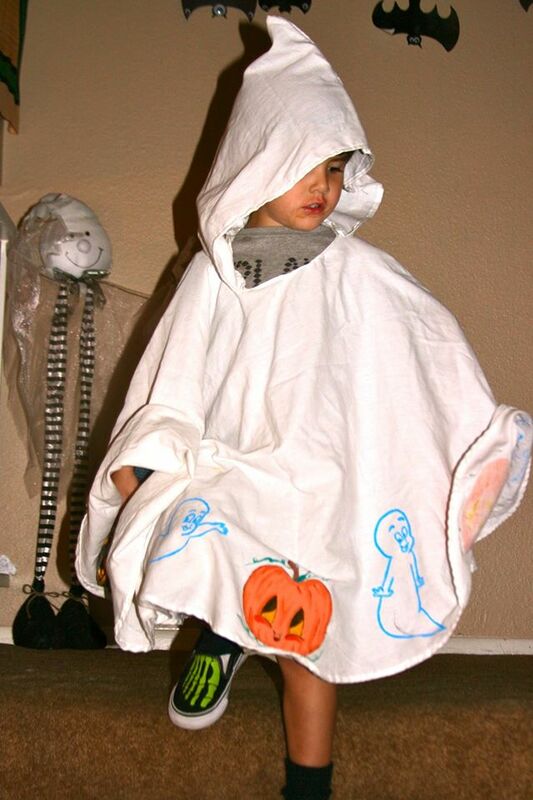 Okay so when I was a child I remember my mom dressed me up in the cutest ghost costume decorated in ghosts & pumpkins. I loved this costume. This year when I was brain storming ideas for my sons Halloween costume, I decided to recreate my very own costume from scratch. The costume was fairly easy to create. As all I needed to do was cut out a large circle, a small circle, attach a hood & paint the creatures on. Since I wanted a large circle, the best way to do this was to fold the sheet in half, draw a half circle and cut it out. To ensure the circle was symmetrical I took a piece of string for the length I thought was appropriate for my son & tied it to a pencil(similar to a protractor). 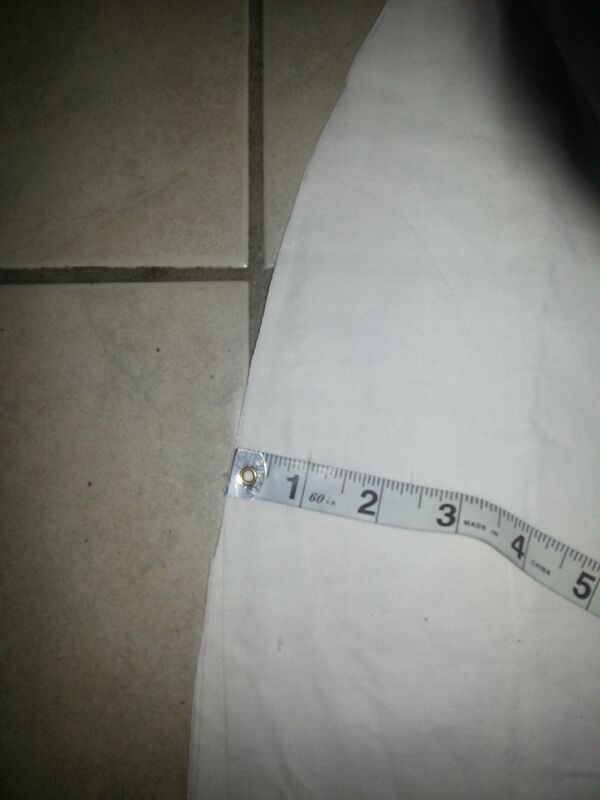 I then pinned the string to the center of the sheet & went around making a half circle. 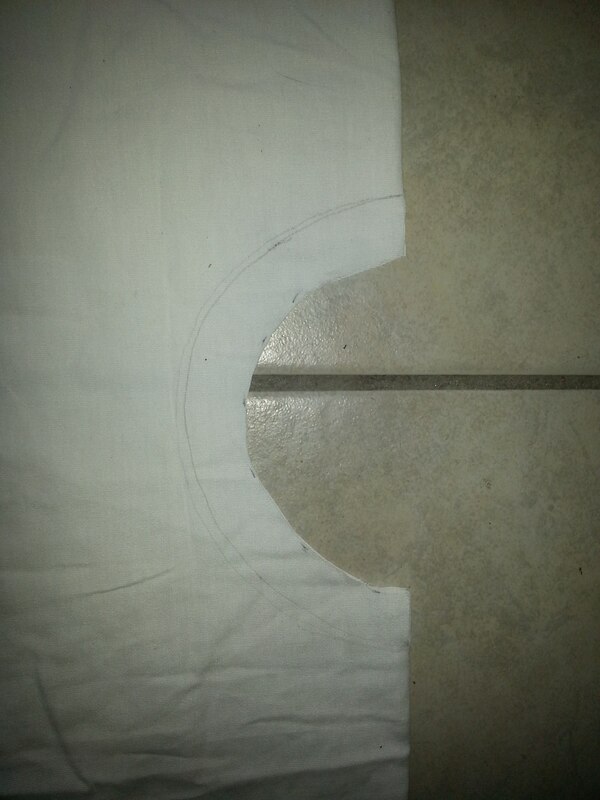 After cutting out the half circle I measured a one inch seam allowance around the edges. After those were made I cut out an opening for the neck. Again I followed the same instructions with the string & pencil and in the center of the fabric(while it was still folded) I drew a half circle and cut it out(make sure the half circle is one inch smaller than intended to make the alterations for the 1 inch seam allowance). Small hole for neck with 1inch seam allowance. Next I ironed the seam allowances to ensure even sewing. 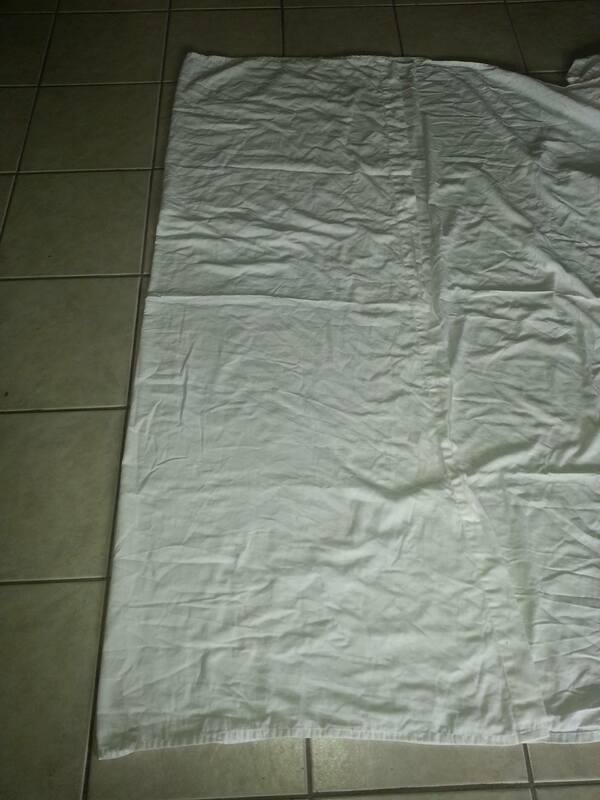 Making sure to fold in the raw edges so the seams were fray-free. To make the hood I simply cut out a rectangle, folded in half & sewed all the edges. I then sewed the top of the hood(or one of the short ends). I then basted the hood & the main piece, synching each piece together for a light ruffly look. 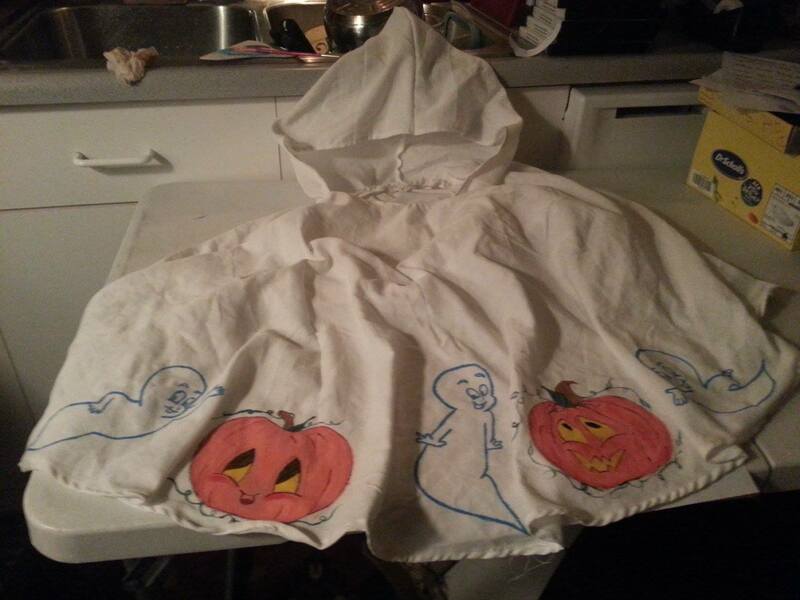 Then I sewed the hood to the cape making sure the right side of the main piece was facing up & the wrong side of the hood was facing up(this ensures the seams are are the inside of the costume. Great now that the costume has been sewn all I needed to do was create the stencils for the characters & paint on them on. 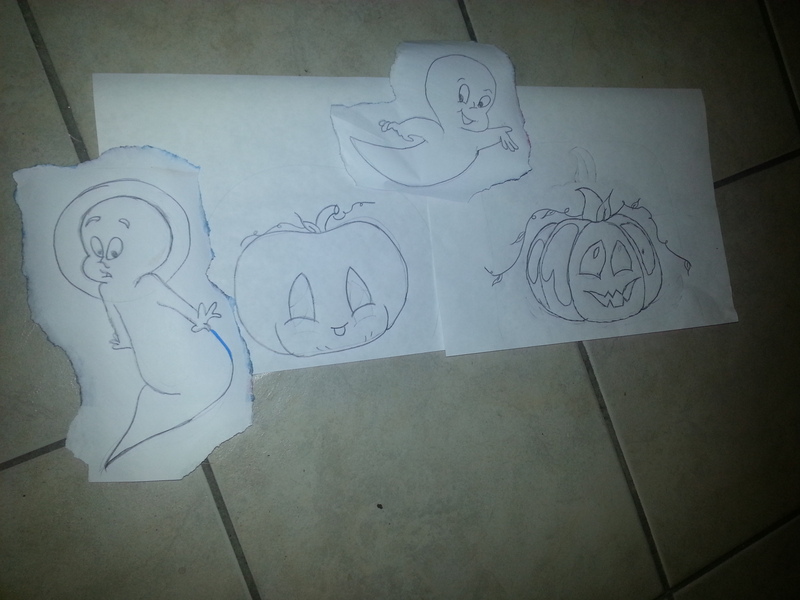 To stencil these onto the costume make sure the lines of the stencil are drawn on hard with a pencil. Then flip them over & place them onto the selected area of the costume. I wanted the characters to be on the bottom of the costume just like mine was. 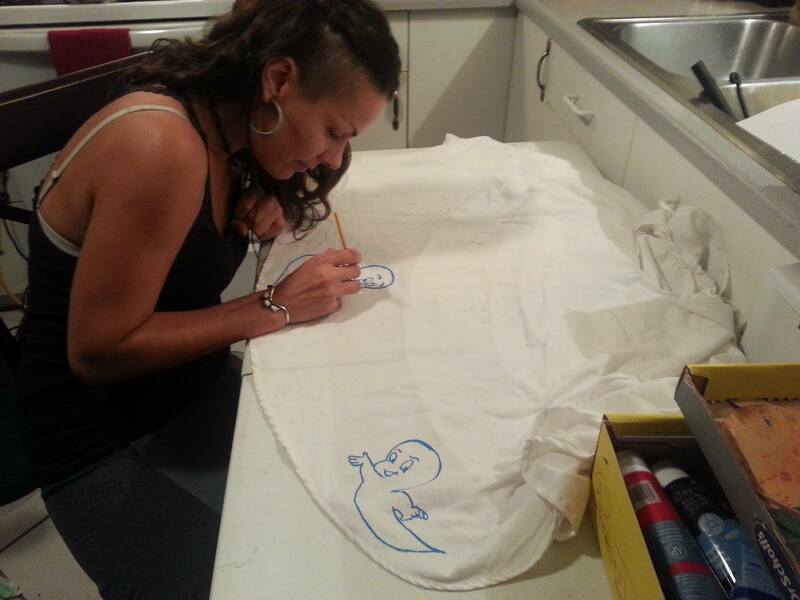 Then simply rub them on the fabric & the stencil should transfer over. Once that was completed I painted in the characters. As the paint dried I sprinkled glow in the dark glitter where I wanted it. 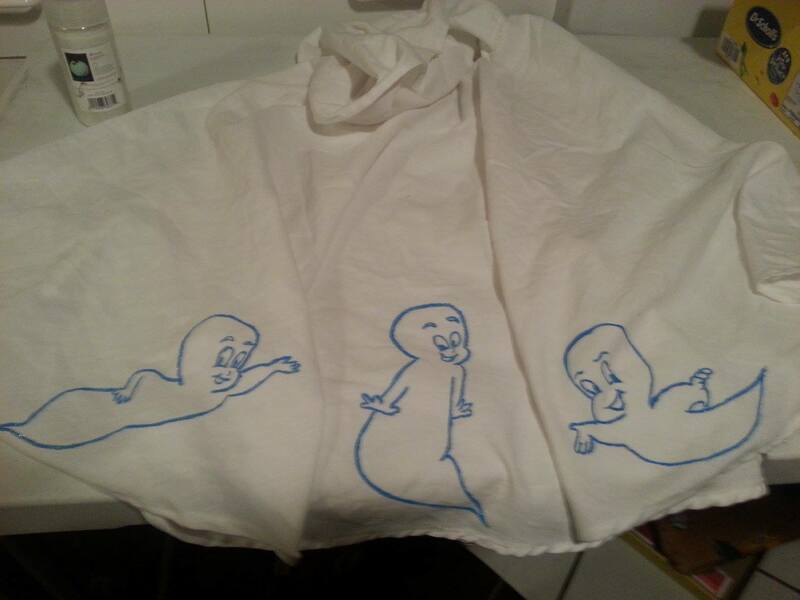 Voila the cutest ghost costume for a little one. 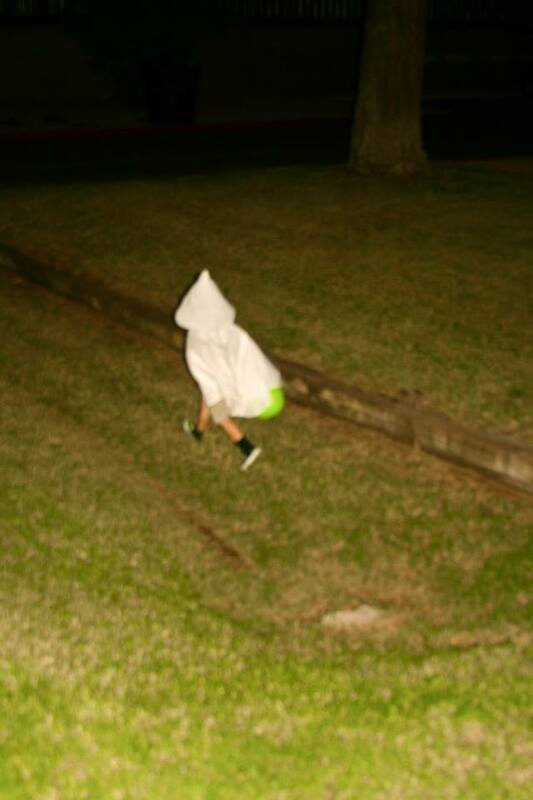 And the best part is I only spent $3-5 5 dollars on the entire costume. How cute is this costume!? !